Crystals have been used for healing, divination, repelling, attracting, absorbing & generating energy, sending out good vibes, balancing the atmosphere of your body and cleansing your aura for thousands of years! Both Solitaire & Salubrious both wear crystals being Voodoo Practitioners for a variety if reasons. FREE Domestic Shipping (USA and its territories) on all products on this page! Outside the USA? - email us for a quote! 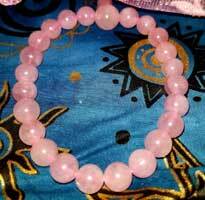 Rose Quartz Bracelet - Rose quartz is known as the "romance" stone and is used often in matters regarding attracting love. Also used in healing the heart from emotional hurt. 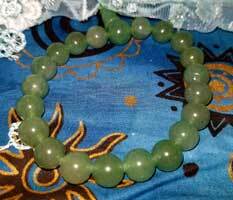 Aventurine Bracelet-Aventurine, also a healing stone, is often used to increase intelligence, perception and creativity. 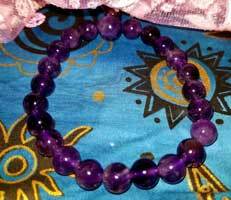 Amethyst Bracelet - Amethyst is worn to help with healing-both spiritual and physical. It is also used for calming and focus. 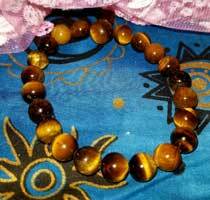 Tiger Eye Bracelet-Tiger Eye is worn to help release fear and anxiety. Helps to bring balance and harmony. 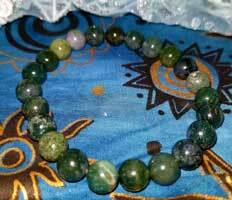 Moss Agate Bracelet - Moss Agate is used to help attract wealth, prosperity and great self esteem. 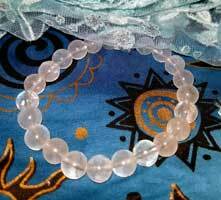 Clear Quartz Bracelet - Clear Quartz Crystal is well known for it's ability to clear negative energies. It is also used to enhance higher spiritual receptiveness. It is considered the master of all healing crystals due to its ability to increase healing vibrations of other crystals. 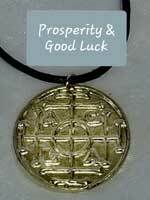 Prosperity and Good Luck Amulet - Attracting magical energies to tilt things in your favor, this talisman is intended to help provide good luck, long life, and better chances of success. A powerful addition to your Good Luck and Prosperity charms. Love Amulet-Attracting magical energies to help bring Love to you, this talisman is intended to help attract love and keep it safe. An excellent edition to your love-drawing charms. 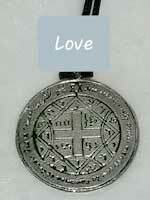 - Attracting magical energies to help protect the wearer from danger and evil influences. 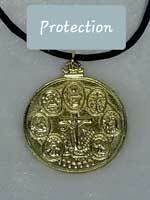 This talisman makes a very good edition to your protection charms. Healing Amulet - This amulet is empowered with the intent to aid in healing. An excellent addition to use with healing crystals, etc.